Running a profitable HVAC business – whether a small family owned business or one with hundreds of technicians on staff – is hard work! You have to efficiently schedule customer requests, dispatch technicians quickly, handle estimates and invoices simply, while ensuring that your HVAC services are done on time and within budget. ReachOut Suite was built with service companies such as yours in mind. We understand the need to equip your HVAC technicians and mechanics with the right piece of technology. One that is intuitive and easy-to-use, that will enable them to save time, stay organized, and eliminate paperwork headaches. That’s where we come in! Our suite of products helps companies manage customers, assign technicians, and track work orders easily. ReachOut Suite works on any computer or tablet and we have a app for your field technicians to use on their own smartphone. Our clients have successfully cut operational costs, improved their turnaround times and gotten rid of paper using ReachOut and you can do the same too. Servicing clients is the lifeline of any HVAC company. Using ReachOut, you can view all customer information, create new service requests, track service history and manage inventory of entities you manage for them from anywhere you can access the internet. You are no longer tied to your office and you do not need complex excel sheets or paper forms to manage your business. Our companion mobile app for field technicians will alert them when new service requests are assigned to them and provide them with the necessary information to complete them on time. The mobile application works on both android and iPhone devices and will work even when you are offline at the work site. The data is synchronized to the cloud when you are back in the coverage area. It is effortless to conduct field inspections and augmented your audit reports with images, notes and recommendations right from the mobile device. Scheduling and dispatching your techs to the right client location armed with information on what needs to be done will impress your customers and improve your first-time fix rates. Your technicians will receive an alert on their mobile app when new service requests are assigned to them. Assign new customer requests based on availability, expertise and reduce travel time of your workforce. Improve turnaround times by allowing your field techs to add estimates such as labor, overheads, part cost and price information to their work orders. This combined with the photo upload and annotate feature will provide your customer and your office staff with more information on the exact issue reported. Why depend on phone calls when an image can say a thousand words! Access all business data from a single portal such as customer information, service requests, material availability, work order status and more. Make sense of your data through reports and historical performance metrics. Identify service gaps and improve your organizational efficiency. Start up at no cost: your first three users are free. Transform your business with the affordable, powerful, and digital command post used by a growing number of tech-savvy HVAC — Reachout. Mobile technologies are revolutionizing the way HVAC teams execute their work. Our software experts carefully compared and reviewed the top apps to benefit the HVAC contractors and technicians while performing their daily tasks. Easily create and assign HVAC work orders in the field or from estimates and service requests. 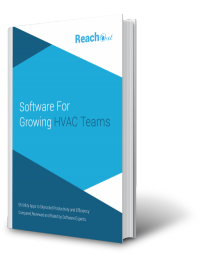 Try out ReachOut Suite for free before you research for another HVAC service software to manage your HVAC business. Our tool helps you manage HVAC estimation, scheduling, dispatch, accounting and customers with ease using our cloud-based solution and companion mobile app for your field technicians.